The International Journal of Energy and Environmental Engineering (IJEEE) is a multi-disciplinary, single-blind peer-reviewed open access journal published under the brand SpringerOpen, covering all areas of energy and environment related fields that apply to the science and engineering communities. IJEEE aims to promote rapid communication and dialogue among researchers, scientists, and engineers working in the areas of energy and environmental engineering. 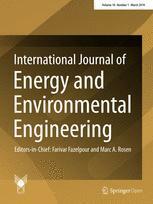 The journal provides a focus for activities concerning the development, assessment and management of energy and environmental engineering related programs. It is hoped that this journal will prove to be an important factor in raising the standards of discussion, analyses, and evaluations relating to energy and environment programs. Article-processing charges (APCs) for all authors are covered by Islamic Azad University (IAU).